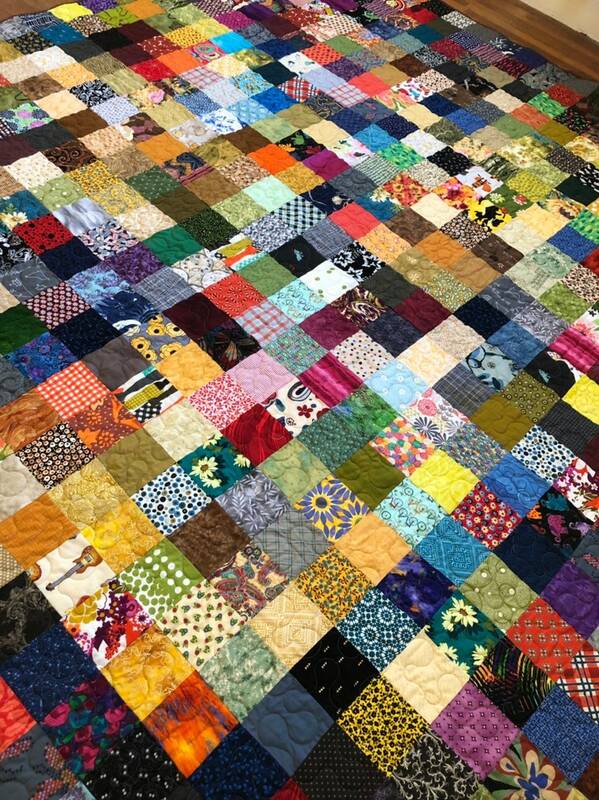 Stunning fall colors combine to make this queen size patchwork quilt a real beauty! Quilt measures 94" X 96". The backing fabric is a beautiful brown floral cotton. The double folded machine sewn binding is a rich brown fabric. The batting is a cotton blend and the quilt has been professionally quilted in an all over meander. Quilts are wrapped in an organza bag with a gift card attached. Lime green, navy, royal blue, red, gold, lavender, silver bags -choose in comment box. I ordered this quilt because I thought it would brighten up our bedroom. I was so right! It's beautiful and makes me happy every time I look at it. Added bonus is that it's beautifully made. Just gorgeous!! It will brighten up my bed this winter!! Wow! My quilt is a work of art! The stitching and fabrics are top quality and the assembly is perfect. My quilt is flat and drapes evenly. It's very large and fits my King-sized bed. Thank you! I can't stop going into my bedroom and admiring the quilt! The colors are beautiful. Fast delivery and professional packaging. We absolutely love the vibrant colors & craftsmanship of our new quilt!